The Chairman of the Board takes to a movie scoring stage to make a classic album. The Concert Sinatra is a misleading title as it is not a live concert performance at all. What it is, however, is the sound of Frank Sinatra, Nelson Riddle and a large orchestra pushing the boundaries of recording technology for 1963. The album was recorded using 35mm magnetic film on a motion picture scoring stage. As stereo was in its infancy, multiple recorders were synchronized to take advantage of the full stereo spectrum. The master recording “Magnestripes” have not been used in any subsequent releases of The Concert Sinatra – until now. Recently discovered by producer Charles Pignone sitting unused in film cans, the original masters are a revelation. More of Nelson Riddle’s fantastic arrangements are present and Sinatra’s voice is warm and upfront in the mix - But what of the music? Comprised mostly of old show tunes, mostly written by Richard Rodgers, The Concert Sinatra finds the Chairman in fine voice in one of his best Reprise albums. 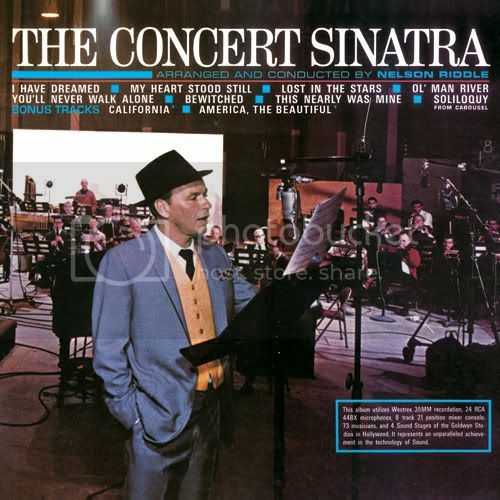 The disc opens with “I Have Dreamed,” originally from The King And I. Sinatra’s voice conveys the longing and excitement of new love, building in intensity until the track’s dramatic ending. It is a stunning rendition and one that stayed in his live repertoire for years. Along those lines is the beautiful, “My Heart Stood Still.” Sinatra first heard Riddle’s orchestration of the track on a Peggy Lee album and liked it so much he decided to record it himself. A wise move to be certain as Sinatra owns the song, finishing with yet another big note. The album’s showcase track, however, is the Show Boat gem, “’Ol Man River.” While Sinatra changed some of the original, racially insensitive lyrics, the song about the struggles of African Americans on the Mississippi loses none of its power. When Sinatra sings, “You and me, we sweat and strain,” the listener is transported to the old South, such is the conviction of his vocals. Likewise, the line, “I’m tired of livin’, but I’m scared of dyin’” is delivered with chilling intensity - a stunning performance to be sure. The original album ends with “Soliloquy,” a classic track from Carousel that Sinatra first heard in 1945, when he had recently become a father. As such, he was able to easily relate to this story of a man waiting for his first child to be born. Sinatra turns in an inspired performance on this eight-minute track that never overstays its welcome. The CD includes two bonus tracks, “California” and “America The Beautiful,” the former of which was originally pressed as a single at the request of then California governor Edmund G. “Pat” Brown to be given to guests of a Sacramento gala. The CD includes both the original liner notes from Lawrence D. Stewart and Raymond V. Pepe, along with new liner notes from Frank Sinatra Jr. While The Concert Sinatra is short - under 40 minutes even with the bonus tracks - it contains some of Sinatra’s finest vocal performances from the era and some of Nelson Riddle’s best orchestrations. For these reasons, it belongs in any Sinatra fan’s collection.